A five-way chili at Skyline Chili on Ice Way. Greek Salad at Skyline Chili on Ice Way. The Chili Burrito Deluxe at Skyline Chili on Ice Way. 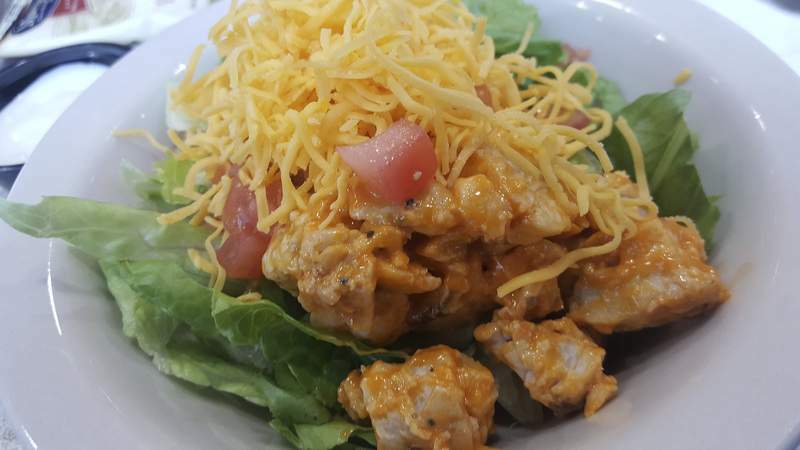 A side bufflao chicken salad at Skyline Chili on Ice Way. 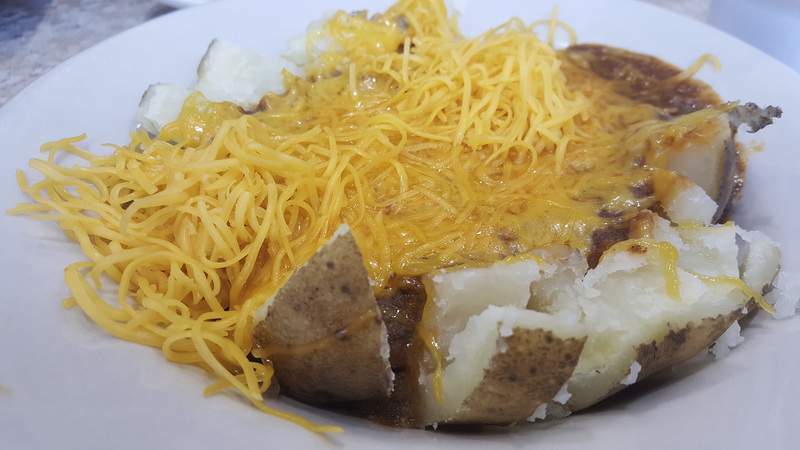 A chili-cheese steamed potato at Skyline Chili on Ice Way. Chili-cheese fries at Skyline Chili on Ice Way. 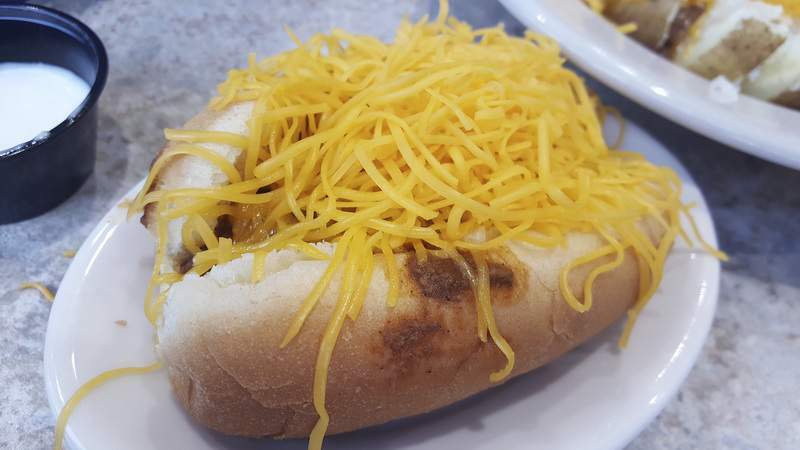 A cheese Coney dog at Skyline Chili on Ice Way. 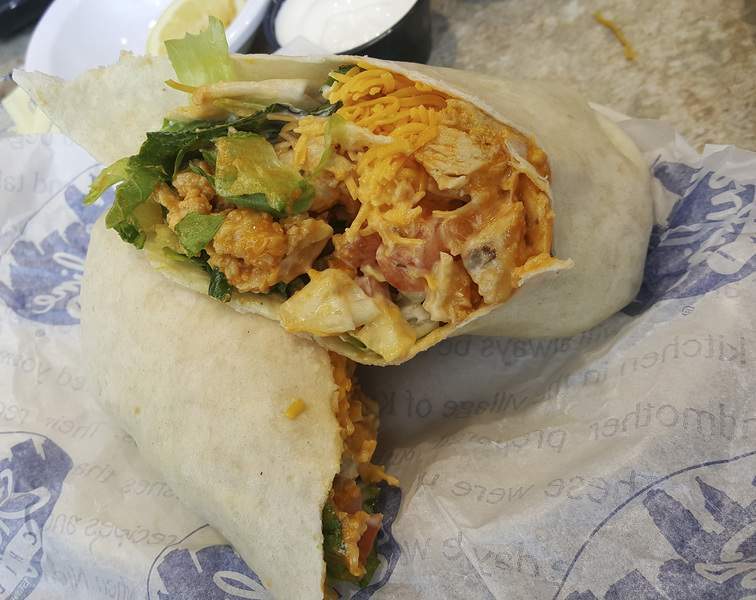 A classic chicken wrap at Skyline Chili on Ice Way. Dutch Apple Pie a la mode at Skyline Chili on Ice Way. Funnel fries at Skyline Chili on Ice Way. It took well over a year after it was announced Skyline Chili was coming to Fort Wayne before the first store opened, and the wait was excruciating for many. As a fan of the Cincinnati chain that specializes in, of course, Cincinnati-style chili, I was among those folks. Not long after it opened, I also discovered that for many in the Summit City, Skyline was not a household name. It was just another chain coming to town; the kind of place someone had to tell them about before they visited. 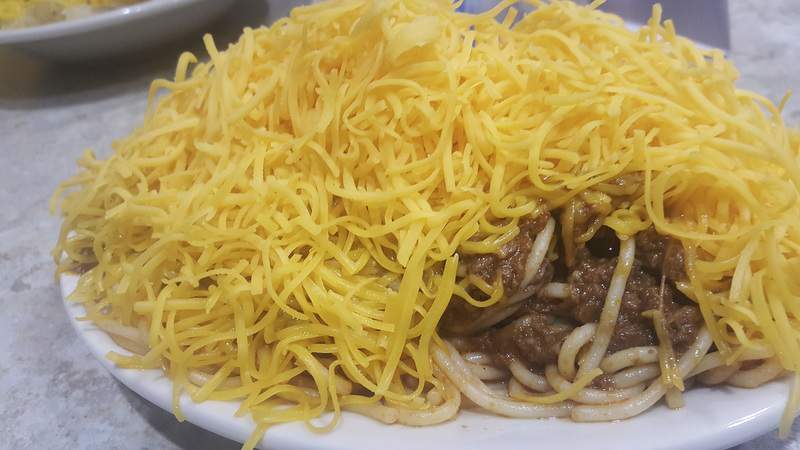 If you know Skyline and like Cincinnati chili, with its unique Mediterranean spice profile, all you need to know is the new Skyline here has everything you want. If you don't know, I will make it simple by saying it all comes down to that chili. If you don't like it, it's probably not a place for you. Given Cincinnati chili has Macedonian roots, the closest local comparison I can offer is the sauce at The Original Coney Island. And, like that coney sauce, the theories about what gives Skyline its unique flavor are plentiful and include cinnamon, nutmeg and even chocolate as ingredients. 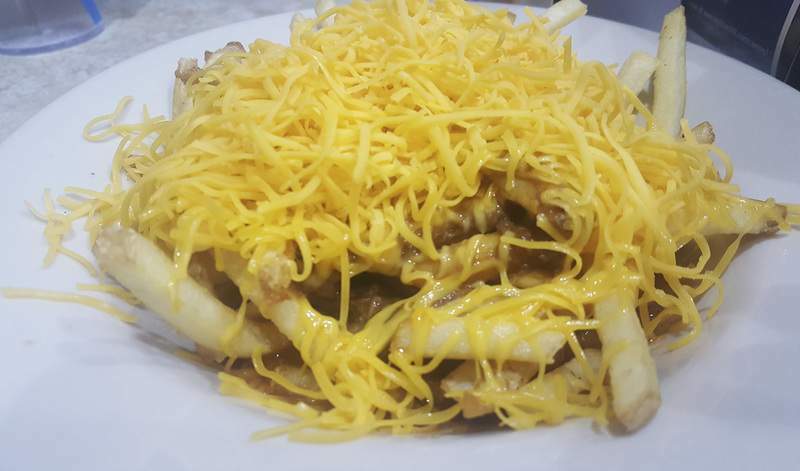 My wife was among the group ignorant to Skyline – a fact that shocked me given my fondness for it – and I was impressed at how the restaurant informed newbies. When our server approached, the first thing we were asked was whether we had been to a Skyline before. When my wife said no, the server did a great job of giving the company line and explaining what Skyline Chili was. The effort to explain the product was something most new chains don't do, just assuming you already know when you walk in the door. That attention to detail carried over to every facet of the service during my visits. Not only are the folks there doing full tableside service, they are doing it exceptionally – from the first little bowl of complimentary oyster crackers that arrived with our greeting to the last query as to if I would like a fresh beverage in a to-go cup before leaving. “You're going out to eat, so you shouldn't have to do any work,” my server explained when I asked if I needed to order at the counter or if they waited on us. Skyline's chili was just right in all of its many incarnations. My favorite is the 5-Way. Unlike the chain's signature dish, the 3-Way, which has chili and cheese over spaghetti, this one also has diced onions and kidney beans. Mine was just as I expected with a ton of finely shredded cheddar covering the entire mound and a little tangy crunch from the onions. That cheese is almost as big a key to Skyline's success as the chili because it goes so well with it. It made my chili-cheese fries fantastic, but it was actually the super crispy fries that were the star because they stood up well under such a heavy blanket of toppings. I may have liked the 3-Way Potato even better than the fries. It had a split and flattened skin-on potato covered the same way. Though they look like baked potatoes, Skyline steams them, which makes the whites of the spuds even fluffier and almost creamy in texture. The best way to describe them is a sort of a cross between baked and mashed. 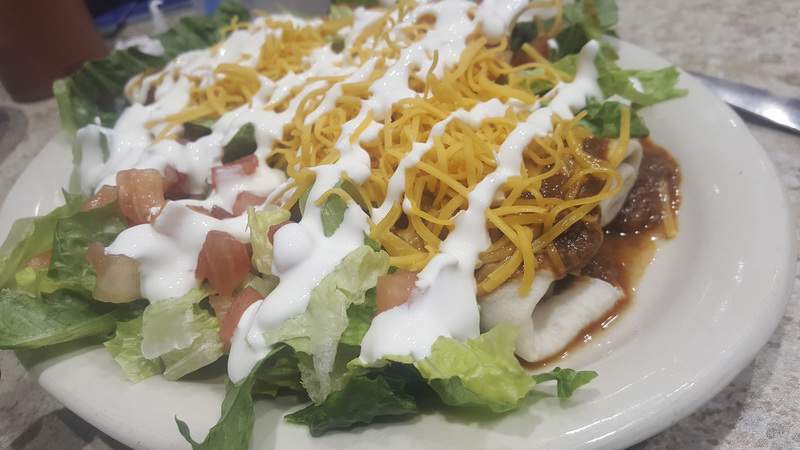 I had high hopes for the Chili Deluxe Burrito which was filled with chili and topped with more chili, along with shredded romaine, tomatoes, cheese and sour cream. The greens were fresh and crunchy and I loved the sour cream with the hearty chili, but the tortilla needed to be stuffed with more chili. It just seemed like it was mostly tortilla. The only chili-related menu item that really failed were the Cheese Coneys. They were tiny hot dogs with buns that were way too big. The “specially made” hot dogs brought nothing to the table in terms of good frankfurter flavor and they were hardly noticeable. A thicker, meatier, beef dog would have maybe stood a chance, but these failed to do so. If chili is not your thing, don't go to Skyline. But if you have to, there are a couple of decent options. The Greek Salad was surprisingly good. 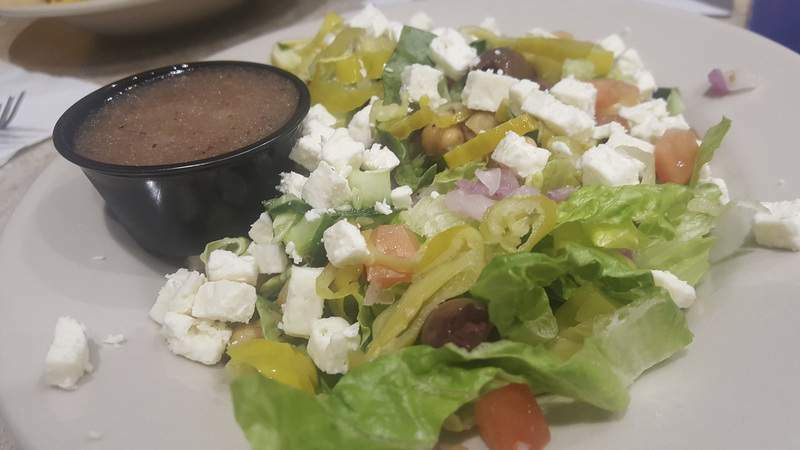 It had cucumbers, chickpeas, grape tomatoes, pepperoncinis, Kalamata olives, red onion, tomatoes and feta cheese, and its vinaigrette was pretty strong so use it sparingly. Its romaine was just as fresh as it was on the burrito and it was cut into easy-to-eat strips, which was nice. The Buffalo Chicken Salad was not as good as the Greek, but still OK. I also liked that I could get a smaller version of either to have as a side with some of the chili offerings. The chicken bits were tender and moist and the sauce had just enough kick without overpowering. With bleu cheese dressing and some of those oyster crackers to serve as croûtons, it was a nice side. The Classic Chicken Wrap was good, well at least the second one was. Also available in two sizes, it had the same tender pieces of chicken that were on the salad packed inside a flour tortilla with lettuce, tomatoes and cheddar. It came with a chili-ranch dressing by default and I was shocked at how spicy it was. Had I ordered the Buffalo Chicken Wrap, I would have been ready for the heat, but this dressing was too hot for a “classic” wrap. When I told my server I did not care for it, he asked if I would like it remade with ranch dressing instead. The ranch version was much tamer. I was also surprised that there were a couple of desserts – neither of which was on the menu – worth getting at Skyline. 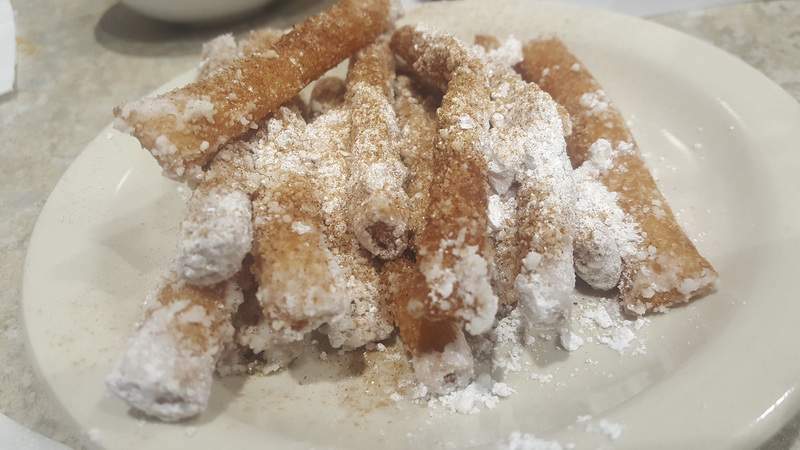 The Funnel Fries were pretty standard issue, but nicely prepared to be crisp and not at all greasy with plenty of powdered sugar. But it was the Dutch Apple Pie, a seasonal item promoted on a little cardboard flier on each table, that I liked most. 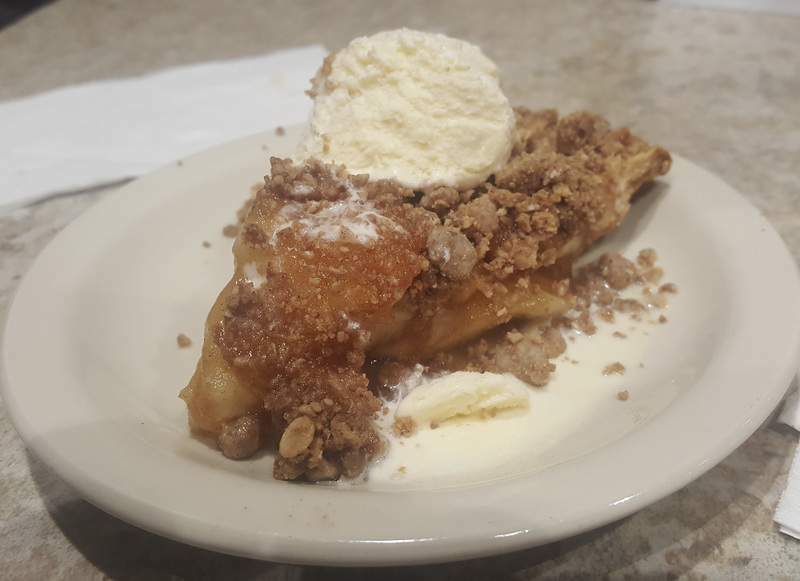 It had a tasty, crispy crumble topping, its apples were still a bit firm and the little scoop of ice cream on top melted nicely and created a great ending to my meal.